The Tennessee Advanced Energy Business Council is the champion of Tennessee’s advanced energy economy. No other entity in the state concentrates specifically on this robust sector. TAEBC champions advanced energy as a job creation and economic development strategy. We educate public officials and business leaders about Tennessee’s advanced energy assets, establish strategic partnerships to connect assets with opportunities, and inform policy that expands and strengthens the industry. 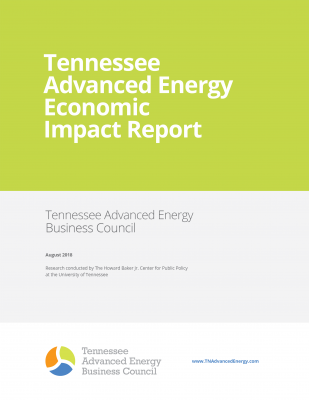 The 2018 Tennessee Advanced Energy Economic Impact Report is further defining the robust scope and scale of Tennessee’s growing advanced energy sector and quantifies its economic impact. It identifies the number of jobs, contribution to state GDP and state/local taxes and number of companies associated with the state’s advanced energy sector.